A skiing holiday may appear as a bit too adventurous for city folk. Those who have never lived on or ventured above the snow-line hesitate at the thought of moving at high speeds on mountainous inclines. Why is it that more families do not consider a skiing holiday each winter and spring? Is the media to blame? Showing stunning pictures of people nearly horizontal in the air, and racy accounts of the perils, give all snow-sports images of grave risks. Or is it the cold environment and the need to buy specialist ski clothing. Professional and competitive skiing does require special skills and equipment, but there is no reason why an amateur or beginner on a tight budget cannot enjoy a thrilling ride on an incline without fear of injury. Gradual progression to paths of greater degrees of difficulty helps a skier have fun and learn at the same time. Nature seems to have kept the needs of beginners in mind when forming the mountains around Val d’Isère. The authorities have chipped in with a thoughtful park, aids at hand on beginner slopes, and careful enforcement of rules to keep all skiers as safe as possible. The helpful ambience is never over-bearing, so children can enjoy their holiday without feeling unduly restricted. Val d’Isère also has jumps to keep world champions interested. Indeed, the resort does sport the names of famous skiers who have trained and competed here. The resort is a favorite with amateurs and professionals alike. You do not have to ski at Val d’Isère. Holiday makers are welcome to use the well-appointed Sports Hall for basketball, a wide range of other games, and to swim. The Spa and beauty-treatment facilities are luxurious. The library is up-to-date with multi-media choices to enthrall an electronic buff. Do not be surprised if a member of your group on holiday gets nearly no time on the snow at all! France is not the only country for a skiing holiday, but its culinary appeal is not to be denied. An added attraction of a skiing holiday in Val d’Isère is that you can learn about cheese and how to make delightful pastries as well. It is easy to visit the surrounding villages, and see how dairy products are manufactured. You can taste a heady selection of cheeses, and take lessons behind the counter at a Patisserie. 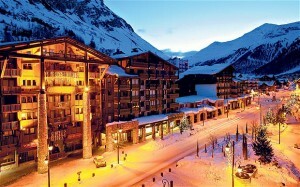 The night revelry, which is a feature of every skiing holiday, is eclectic and ingenious at Val d’Isère. This resort has a prime location. It is an international favorite with a distinctly French appeal. It is equipped to delight people of all ages and interests. The chair-lifts are efficient, safe, and flexible. You can reach the elevation on a slope that suits you with minimal wastage of time. There are more than 250 kilometers of ski paths, so you can look forward to return for many pleasurable vacations here. Accommodation ranges from scenic chalets to sensible hotels and self-catered apartments. The popularity of Val d’Isère means that a sudden trip could leave you cold in the snow. Regular patrons book their rooms well in advance. The resort is a special delight during Christmas, so there is an unusually frantic rush for rooms as the festive season approaches. The Easter break is another top week-end for Val d’Isère. Geneva is the nearest International airport, though domestic flights to Lyon, Grenoble, or Chambery, can also have you on the slopes in a jiffy.